One year ago, Burger King made a Break through in the Social Marketing World with the launch of a Voucher device on Facebook. If you haven't heard of it: BK launched a Facebook application that encouraged users to remove Facebook friends. 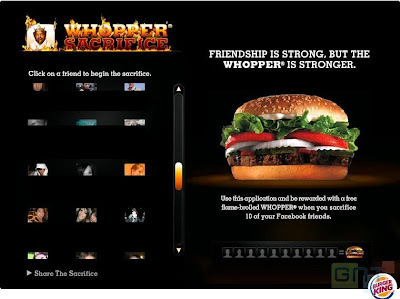 After 10 Sacrifices, the user got a free Whopper. This operation has been commented by all Buzz seekers in 2 times. - At the launch due to the originality as you can read here. Besides this great PR operation, it's from my point of view a real Web-to-store device to take oppotunities from our ROPO, ROBO behaviors. And this doesn't take account the buzz around.